How many times have you taken your kids to a birthday party and been inundated with cartoon characters, wasteful tchotchkes, and uninspired, generic party decorations? It can get pretty monotonous, and at times downright depressing. This is important to us because we believe, especially for youngsters, that being introduced and encouraged in a hobby that takes such great advantage of the outdoors is vital. That doesn't mean you need to push your kids to become outdoorsmen, but a theme party isn't a bad way to start creating a little fisherman or woman. We wanted to fill you in on some good birthday party ideas that have a strong and clear fishing theme. Sometimes a couple latex balloons and a stack of paper plates just aren't going to cut it. And to add to that, you don't have to restrict these ideas to kids! Take into consideration a 30-year-old fishing fanatic and tell us they wouldn't be pumped to have a Gone Fishing birthday party thrown in their honor. We'll split this into two parts: If you're partying with the kids or having a more adult-themed get together. For a kid's birthday party, Goldfish crackers are an obvious go-to snack. Gummy worms make sense too, and can be added to chocolate pudding with crushed Oreo cookie crumbles on top to look like dirt. For the main course, we wouldn't fault anyone who served fish sticks to a group of kids, but homemade fried fish would be an even better way to get across the idea that fishing is fun and productive. For adults, something a little more fancy like smoked salmon or fish tacos is in order. Again, we'd highly suggest using your own wild caught fish if possible. A fish fry, wood-grilled filets, or even sashimi (depending on what you catch or have access to) would be a cool way to make it memorable and stick to the fish party theme. The cake can have an obvious cake topper of a little figure at a fishing hole, or a plastic fish figure (similar to the main image at the top of the post). To be honest, we think the easier way to go would be with a bobber-themed idea. 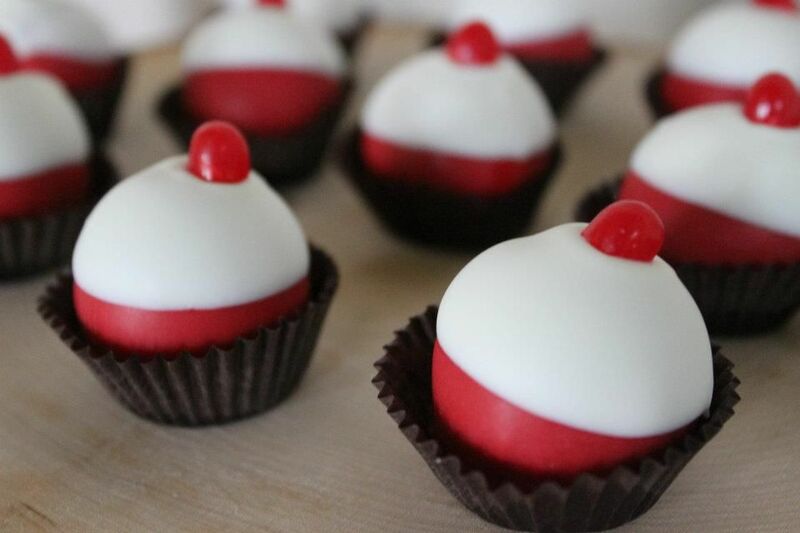 Make a half-sphere shaped cake and ice it one half red, one half white. Add a small and stubby red cylinder to the top of the white portion, and you've got a relatively easy but awesome-looking cake. It's not so much the food but the presentation, and a smart-looking table with some thought out fishing themed party supplies. As far as tableware goes, either fishbowl-type glass or clean, food-friendly buckets are going to make the themed birthday party come across as more authentic. You can easily add a fish net to serve as a table cover, and focus on blue as a dominant color. One of the best ideas we've seen involved spray painting the bottom half of those inexpensive white paper lanterns red so that they resemble bobbers. One pun we just couldn't stay away from is the "Billy's O-FISH-ALLY Turning 5!" angle. It works for both young and old age groups, and is guaranteed to get a chuckle. Try making a homemade sign yourself, and add some printed-out photos of fish while you're at it. It isn't a fishing party without a little fun entertainment, so consider some organized fun for both young kids and adults. For both groups, there's a classic fishing game that has been played for generations which would be perfect for sticking with the themed party. It consists of a sheet hung across a room, or blocking off a corner, so that someone standing on one side can't see the other. Let the sheet hang to the ground, and supply yourself with some cool party favors. But there's one catch: the favors should be easily clipped with a clothespin, and able to be suspended by the force of the pin. Here's why: you can create some crude but effective fishing poles with a broomstick or long rod with a thin rope ties to one end. Make the rope long enough to reach the ground when the pole tip is held at the top of the hanging sheet. Tie a clothespin to the other end of the rope, and you've got your set up ready to go. Party attendees can take turns "casting" the clothespin over the sheet, while a host or hostess is waiting on the other side. They'll clip a party favor to the clothespin, and give a tug, indicating to the fisherman that it's time to flip it over the sheet. If you're working with a kids birthday, you can buy small plastic fish toys, candy (Swedish Fish, anyone? ), or even beginner lures or tackle (just remove the hooks) if the kids are young enough). For adults, stick with lures as a fun way to encourage fishing in the future. Or, go with other fishing accessories like a pocket knife, a neck gaiter, or a set of fishing weights (They'll feel like they're reeling in a big one!). Your Gone Fishing party can't really go wrong if you stick with the main idea and remember to make it fun. Maybe not everyone is in love with it, but a party is a great way to show folks that being an angler is a pretty cool way to spend some of your time. Use your imagination, focus on the kind of food you know, and help someone celebrate a very happy birthday with a unique outdoor spin to it. Checkout this link to my Pinterest Board for more fishing themed party ideas. DIY and links to where to buy the supplies to pull off a fun fishing themed party.